If 24 was a classic Western – and it really should be – it would most likely be High Noon (1952). 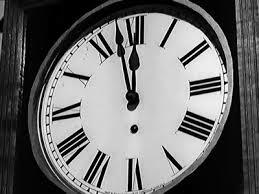 The clock rules in High Noon, slowly ticking down to an archetypal Western showdown between the law and the baddies. The film is all set in one day, which happens to be the wedding day of local Marshal Will Kane and Amy Fowler, played by Gary Cooper and Grace Kelly respectively. The Marshal is retiring from his job into a more peaceful new life with his Quaker missus. Their happy day is ruined by the return of the fiendish Frank Miller, who Will had put in jail some time earlier but has just been pardoned. After abandoning an attempt to flee, to the disgust of his wife, Will returns to town in order to confront his nemesis when he gets off the train. The rest of the film is devoted to an almost real-time countdown for the train to arrive, as Will tries to get a crew together to support him in standing up to the thugs, wading through a sea of small town politicking to do so. Unfortunately though he seems desperately low on support from the townspeople. The film is an interesting mix of classical and innovative approaches to the genre. The final showdown between the foes is pretty standard in the realm of iconic Western. The tense but slow-burn build up, which in many ways is extended bouts of diplomacy is not so standard. A different psychology is at play to most Westerns I have seen with much less of a focus on action. Similarly the scenery consists of predominately agricultural land and the town rather than the open, sweeping John Ford style American plains and valleys. Running down the list of the cast of this film, it would have to be close to the greatest cast ever put together for a Western – Grace Kelly, Lon Chaney Jr., Lee Van Cleef and Gary Cooper. They are all in good form here as well, especially Kelly and Cooper as the (un)happy newlyweds. Both of them are helped by the fact that there are some really interesting elements to their characters. Kelly’s Amy has a fervent belief in her religion and the pacifism that it entails which is examined on a number of occasions in the film. On the other hand, Cooper’s Will is not just a whitewashed, perfect hero. He loses his cool, hits people, doesn’t seem to have all that many friends in town and could most certainly treat his new wife a whole lot better. Directed by Fred Zinnemann the film is astutely shot. 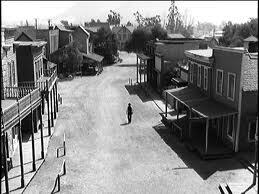 Much of the action takes place either indoors or in the confines of the town, so it is shot much tighter than most Westerns. It is opened up a little by the use of some funky camera angles, such as a close-up of a wagon wheel as the wagon bounces along at great speed. I really enjoyed High Noon, it manages to blend the iconography of the Western with a pretty original approach to the storytelling. It is not one of my absolute favourite Westerns, but if you have any interest in the genre, then this is one you probably want to tick off. You forgot to mention Lloyd Bridges. I like the idea behind the movie, but I don’t like the movie. You don’t mention the music at all in your review? What did you think of that song? I sort of get what you are saying. Whilst I like the film, I think I definitely like the idea of it more than the end product. I recall liking the song. Had something scribbled down about it in my notes I think. What did you think of it? See I really didn’t like the song, which probably contributed to my annoyance of the movie since it is played an awful lot throughout.